Everest 2018: May 25 Team Locations and Headlines Preparing for Everest 2019! Early in May, there was talk of early summits but then the jet stream moved on top of Everest and stopped all activity for a week. When a large high-pressure system parked on the summit, the door was opened and stayed that way for 11 straight days. The first summits were on May 14 by the rope fixing team on the Nepal side followed the next day by 70-year-old Chinese double-amputee Xia Boya with his Sherpa guides. Every day thereafter had summits from both the sides. Overall it was about as good of a season as could be expected on the world’s highest peak. The temperatures were bit warmer than usual and the winds were calmer in spite of the occasional “difficult” summit day. With the long weather window, teams spread out thus reducing the usual crowding we’ve seen before. In 2012 there were less than five suitable summit days forcing hundreds to attempt the peak on the same day. Of all the features climbing Everest the 2nd Step on the Tibet side and the Khumbu Icefall on the Nepal dominates the attention. This year the Icefall was well behaved. The Icefall Doctors got the route in pretty early and took it direct making it fast and safe. There were a few incidents with serac collapses and the normal delays but overall long-time guides raved about the work of the Docs. This avalanche occurred late in the season in the afternoon when no one was in the Icefall. But the big obstacle was just above Camp 1 in the Western Cwm where somewhat deep crevasses are expected but this year a “Ice Wall” created a hazard that some people just couldn’t handle. The largest story of the season was when multiple teams experienced the nightmare scenario of having their supplemental oxygen systems fail above 8,000 meters. All the systems were made by the same company, Summit Oxygen out of the UK. The regulator which manages the flow rate between the bottle and the mask opened and sent life-giving oxygen into the atmosphere. All of the teams except for Alpenglow had enough spare regulators to salvage their summit bids. Adrain Ballinger’s Alpenglow suffered 10 out of 39 regulator issues, the most of any team, and had to abandon their push. Most of their members went home but a small team stayed and summited a few days later. Neil Greenwood, CEO of the supplier flew to Kathmandu to personally oversee the troubleshooting process. I’ve successfully used their systems on K2 and Manaslu with no problems. Other operators had no issues. There were records set in 2018, primarily by Sherpas. Kami Rita Sherpa at age 48 set the record for most summits, male or female, with 22 breaking the one he shared with Apa Sherpa and Phurba Tashi Sherpa. He says he wants to reach 25 before retiring. Lhakpa Sherpa, 44 from Connecticut, broke her own female record with her ninth summit on May 16th. Australian Steve Plain broke the record for reaching the summits of each continent in 117 days. The old record was 126. He summited Everest, his last of the seven on May 14th. Kenton Cool broke his own mark for most summits by a Briton at 13. And perhaps most stunning was the victory by 70-year-old Xia Boyu, the double amputee from China who summited only after winning an appeal to the Nepal Supreme Court to overturn a ban against double amputees climbing Nepal’s mountains. The Nepal Ministry of Tourism told climbers not to talk to the press about major events on Everest this year. They also said not to talk about the Hillary Step, more on this later. Thus it’s not surprising we have heard little about rescues and other dramatic events. I recently spoke with the CEO of Global Rescue, Dan Richards. They run the largest rescue service on Everest providing coverage from medical events to natural disasters. They covered my evacuation in 2015 after the earthquake trapped 100 people in the Western Cwm. Richards said they had already conducted 66 operations just on Everest and were doing two to three a day. I asked him if there was a conflict with some guide companies owning their own helicopters and perhaps claiming a member was sick then charging GR for the rescue to generate income. He said this “conflict of interest” is one reason why they have a strict policy on which helicopter companies they use and that all evacuations must be organized and provided by GR. A GR rescue specialists (generally a medic or a doctor) is either on the ground or in the helicopter to oversee the operation and provide immediate medical assistance. He said they do not work with operators that are not transparent with helicopter service records and pilots that don’t have high-altitude training and experience. We discussed the increase in inexperienced members and unqualified guides on Everest. Richards felt that this has increased the number of operations they conduct and eventually could result in higher membership costs, premiums or in some cases limitations on the coverage. The net results will be increased cost and risk for everyone. We’ve come to expect deaths on Everest, in fact, the median is four annually since 1921 but has increased to six each year in modern times since 2000. However with more people climbing each year, you might expect the death rate to have risen but in fact, it has gone down from 1.06 on the standard routes between 1921 to 2018 to 0.82 since 2000. The use of more supplemental oxygen, improved weather forecasting, staying on known routes and an increase of Sherpa support for foreigners, all have helped make Everest safer today than ever. In 2017, there were seven deaths while this year there were five on Everest and one on Lhotse. Even though the Nepal Ministry of Tourism still denies that the Hillary Step has changed, perhaps fearful the news might hurt business, it has changed dramatically. The previous 40-foot off-width rock scramble at 28,840 feet was a large bottle-neck for climbers on the Nepal side. Often waits of over an hour would occur on busy days, however, this year climbers simply walked up a 30-degree snow slope, or took the steps kicked in by hundreds of people over the season. It’s unlikely that the natural melt-freeze cycle caused the change because at that altitude, snow and ice evaporate and doesn’t melt. Most likely the car-size boulder that defined the “Step” was shaken loose in 2015 during the 7.9 magnitude earthquake. All of these teams had 100% success so maybe you can buy your way to the summit. Charging $110,000, Lukas Furtenbach of Furtenbach Adventures took only 21 days for his team of four “normal” members and one guide to summit Everest from the Tibet side. He believes the use of “pre-acclimatizing” at home with altitude tents is the key. They only made one rotation to the North Col before going to the summit. A high-powered team of mountain guides and pro skiers with Alpenglow using a similar program with Alpenglow summited the 8000-meter peak, Cho Oyu, then Everest in 23 days. Alpenglow charges $80,000 for Everest. Finally, not to be outdone the Nepali guide company Seven Summits Treks put all three of their VVIP members on the summit after they paid $130,000 each. That price included a mid-climb holiday in Kathmandu via their private helicopter. Another trend that became real this season are the lavish amenities supplied by operators. 7 Summits Club took top prize with two room member “tents” complete with cot, chair, computer table and more. These days almost every operator has a heated dining tent, movie nights and unlimited Internet. In the department of “Is anyone really in charge?”Matt Moniz and Willie Benegas had to deal with over a week of unknowns to see if they were even allowed to attempt to summit. After they skied down the Lhotse Face, they were told they didn’t have the proper permit and faced fines, deportation and bans. They had purchased climbing permits but were unaware they needed skiing permits because they planned to ski from the Lhotse summit. The Nepali logistics agency who is required to understand all the rules failed to inform them saying they didn’t know they were skiing which was odd because they had talked openly about this for months and had skis with them when they met in Kathmandu. 150 Sherpas signed a letter in support of Matt and Willie. In any event, the pair never suffered any penalties as the Director General of the Ministry of Tourism determined it was a “very innocent mistake” and gave them his approval to climb. They made the climb so fast that they had to slow down and stop near the summit otherwise they would miss the sunrise. Matt messaged “We went way too fast, we are burrowed in at south summit waiting for the sun.”. They summited Lhotse the next day leaving from the South Col.
Tenji Sherpa and Jon Griffiths, summited Everest to honor Ueli Steck who died last year on Nuptse. The three had planned to summit Everest by the West Ridge, then traverse on the summit ridge to Lhotse. This year, Tenji and Griffith summited by the normal route, but Tenji didn’t use supplemental oxygen. 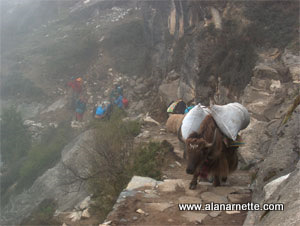 They wanted to also get Lhotse but stopped after Everest. Griffith planned on live streaming the effort on the National Geographic Facebook page but it is still not posted. This effort seemed to fall short on all their goals: Tenji used oxygen after all, they didn’t attempt Lhotse and the Live Stream never happened due to sat phone issues according to Jon in a note to me after the season was over. Identical to Steck’s plans of climbing Everest Lhotse via the ridges Horia Colibasanu and Peter Hámor had to abandon their effort after experiencing unstable snow between Camp 2 and the West Ridge. Guy Cotter of Adventure Consultants and his client wanted to summit Everest, Lhotse, and Nuptse, the three peaks that define the horseshoe around the Western Cwm. They got two out of three but again, unstable snow this time near the top of Nuptse blocked their summit. You will read a lot in the mainstream press about trash on Everest David Liano sounded the alarm after seeing so much at Camp 2 and above. He said, “What’s happening to Everest is shameful and, although I’ve tried to have a net positive impact on the trash problem during my climbs, the reality is that every climber contributes to the problem. I’m trying to be part of the solution. ” The root cause of the trash at C2 is from the 2015 earthquake when teams abandoned their camps. I saw it myself in 2016. In my prior years, there was little trash from C2 and above. There was a plan to have the helicopters that ferried the rope to Camp 2 for the fixed line above C2 to bring trash down, but I guess that didn’t happen. Pilot Maurizio Folini said in 2015 he flew 6 loads from Camp 2. I fully agree this is a problem and needs to be addressed by all involved – members, Sherpas, LO,s and the Ministry of Tourism – all are complicit but none bear the sole fault – imho. Everest and Lhotse were not the only peaks under siege this spring. The weather was more difficult on most of these peaks than on Everest with Dhaulagiri seemingly getting hit the hardest. Cho Oyu – Alpenglow, Summit Climb Germany, Rolfe Oostra with 360 Expeditions all had summits plus Bulgarian Atanas Skatov summited with no Os and no Sherpa climbing support. Makalu: Thomas Lämmle summited without Os. Ang Dawa Sherpa died at Makalu base camp from altitude related issues. Dhaulagiri: Seven Summits Treks said 8 Indian climbers summited but those on the peak said were no summits. Its now reported Seven Summits Treks made a mistake and there were no summits of the team. I find this disturbing that such a report was made in the first place suggesting that Seven Summits places “victory and PR” over safety and accuracy. Carlos Soria seeking his 12th 8000er abandoned his ninth attempt on the peak due to bad weather. My Colorado climbing buddy, Ryan Kushner, got to 25,000 feet before weather stopped his small independent team. Italian Simone La Terra was blown off the mountain to his death when a gust of wind hit his tent in a flat area. Kanchenjunga: Multiple summits in difficult conditions and a near death of Israeli climber Nadav Ben Yehuda – נדב בן יהודה . Chris Burke summited and on 20 May, Asian Trekking put 11 climbers on top. Annapurna: Korean climber Hongbin Kim with four Sherpas from Seven Summits Treks summited on 13 May. Shishapangma: The Chinese “closed” the mountain after a high-profile, unsuccessful search for missing climber Boyan Petrov. Manaslu: a Swiss team abandoned their effort due to avalanche conditions. To wrap up this season, many people will claim to have been the first from this zip code or wearing that color down suit to get themselves in the record book but this is my favorite of the season. Neil Laughton submitted to Guinness a world record claim for the world’s highest dinner party. They had champaign and wore evening gowns and tuxedos at Base Camp on the Tibet side. And who said climbing isn’t civilized? They raised over $135,000 for Community Action Nepal – a charity that supports Nepalis. 2018 has been a good year on Everest, no a great year! Record summits, the deaths, while tragic, were not the expected type of inexperienced climbers on low-cost teams, all seems to part of the gamble when climbing an 8000 meter peak. But I want to end this post with a video I found delightful. This wraps up my Everest 2018 coverage. I will continue to post about climbing news, plus do my best to cover K2 starting in July. I want to thank you for your interest in my writings. This was my 16th year of covering all things Everest. I want to remind my readers that I am just one guy who loves climbing. With 35 serious climbing expeditions including four Everest trips under my belt and a summits of Everest in 2011 and K2 in 2014, I use my site to share those experiences, demystify Everest each year and bring awareness to Alzheimer’s Disease. My mom, Ida, died from this disease in 2009 as have four of my aunts. It was a heartbreaking experience that I never want anyone to go through thus my ask for donations to non-profits where 100% goes to them, and nothing to me. Any amount that is meaningful to you is meaningful to me. Select your own Alzheimer’s organization or I have suggestions at this link. I was very sad to read of the deaths this year on Everest. RIP all brave souls and sympathy to their families and friends. I admire all mountaineers tremendously. Really I would love to have this adventure myself, perhaps I might get to Base Camp one day. Thank you thank you thank you Alan! This has been my 7th season reading your blog & each year is equally compelling! Keep up the excellent work Sir! Thanks Peter … It’s getting harder to come up with unique coverage!! As always thank you! What a great season of coverage – I was in Grand Tetons and Yellowstone the past 15 days, but still had a few minutes everyday to check in and see what was happening on Everest. You’re hard work and dedication to the community is awesome and inspiring. Because of you and this blog, I’m planning my own trips now to the mountains and getting back to what I loved as a teen – the mountains! God bless and look forward to your K2 coverage and hope to connect with you on some coaching soon. Thanks Mike. Glad you are getting to the Hills. Let me know how I can help. Thank you so much for your coverage of another year on the mountain! I have always enjoyed reading your posts and your thought and feelings on the news coming off the mountain. I am planning a trek to Everest in two years, and then some serious climbing starting here in Colorado, and then some higher mountains, before looking to filling a life long dream of climbing Everest. Thanks you so much Alan, for your dedication and for everything. Truly impressive numbers this season! Great work Alan, I followed your posts every day. Thanks so much for your dedication to reporting accurate and unbiased information. Your personal experiences are a nice touch. I look forward to the upcoming summer seasons. My name is kobayashi in the lì chéng office. Thank you very much for your hospitality to lì chéng. I understand the details of the incident at the time, and there is a correction here. When the first report was found in the first report of the body of lì chéng, there was an urgent contact with Japan and the shooting team, but it was said that he had died in low temperature, but in fact, lì chéng was 7400 He went down from camp 3 to the mountain, and struck his head and whole body, and he was not returned. In the confusion, I apologize for the fact that I have told you the wrong information. On the 20th, MT. Lì chéng climbed up to 3 meters high on the southwest wall of MT. Everest, looking for a place where a tent was held, and a little bit of a tent. In order to go down to the mountain, he told the shooting squad to go down and go down the mountain. After that, when the radio was lost, it was not coming down until the shooting team went up to the top of the search, and found a lì chéng that died near 6600 m above sea level. It seems to be from the state of the body, and it seems to be about 100-200 M.
The damage of the dead body was not large, but in peace. Due to the wishes of the bereaved family, we are going to be cremated and funeral only by relatives. I’m sorry to have asked you about the funeral, but I appreciate your understanding of your family’s nature that you want to be quiet in the natural nature of the Native Hokkaido. In the future, I would like to have a farewell party for everyone who wishes to come to us in various places in Tokyo. Thank you very much for your support for lì chéng. Alan, terrific coverage as always. I have a question about summit day. From reading your blog this season it seems the majority of climbers summitted during the morning, perhaps aiming for sunrise and in one case Matt and Willie had to wait because they were climbing too fast! Reading Into Thin Air it seems the teams in 1996 were all aiming to summit in the early afternoon. Is this a conscious change in strategy that climbers now go through the night because it’s safer or is it entirely dependent on the conditions of each season? It’s preferred to climb on snow/ice covered surfaces when it’s as cold as possible to minimize the risk of snow bridges collapsing and falling into a crevasse or being is soft mushy snow – in other words it is easier and safer – usually. This is why they go through the Khumbu Icefall pre-dawn when its more frozen and seracs are less likely to fall. Also, while less a threat on an 8000er like Everest, storms develop in the afternoon. Most teams try to summit between 5 -9 am so they can be back to their launch camp, or lower, a few hours later. Inn 1996, Adventure Consultants had a turn-around time of 2 pm. These days, most guides would start talking to their member if they are not to the summit by 11 or noon. Hope this helps. Hi, Richard Wages. I second that notion. Thanks Alan for another great season’s coverage. I know you work very hard to uncover the facts and information plus all the time it requires you to write it down for us to enjoy and learn from. I really appreciate it. Very appreciative of your work here ? ?